-Diabetes (uncontrolled diabetes (Type 1 or 2) for many years. *-High blood pressure for many years. These are the top 2 causes of most chronic kidney disease. Controlling these diseases can help slow or stop the damage to the individual’s kidneys who has one of these, if not both. To diagnose chronic renal failure is pretty much the same tests that are listed above on acute renal failure plus:Chronic kidney disease is also called chronic renal failure or chronic renal insufficiency.There are five stages of kidney disease, from kidney damage with normal GFR to kidney failure. So GFR will help the MD rule out acute versus chronic to give the MD direction on Rx.Your doctor will ask questions about any past kidney problems. He or she will also ask whether you have a family history of kidney disease and what medicines you take, both prescription and over-the-counter drugs. Treatment (Rx) for Chronic Kidney (Renal) Failure:There are things you can do to slow or stop the damage to your kidneys. Taking medicines and making some lifestyle changes can help you manage your disease, prevent further damage to the kidneys, if their functioning at all and make you possibly feel better. One way to measure how well your kidneys are working is to figure out your glomelular filtration rate (GFR). The GFR is usually calculated using results from your blood creatinine test. Then the stage of kidney disease is figured out using the GFR (glomelular filtration rate). There are five stages of kidney disease, from kidney damage with normal GFR to kidney failure. In complete renal failure you have 2 choices for Rx. **Dialysis is a process that filters your blood when your kidneys no longer can. It is not a cure, but it can help you feel better and live longer. **Kidney transplant may be the best choice if you are otherwise healthy. With a new kidney, you will feel much better and will be able to live a more normal life. But you may have to wait for a kidney that is a good match for your blood and tissue type. And you will have to take medicine for the rest of your life to keep your body from rejecting the new kidney. 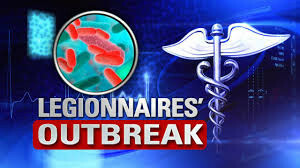 The top illness of the month seems to be Legionnaires. Legionnaires’ disease is a severe form of pneumonia — lung inflammation usually caused by infection. 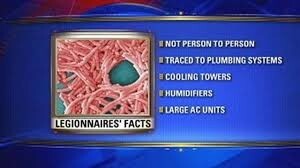 Legionnaires’ disease is caused by a bacterium known as legionella.